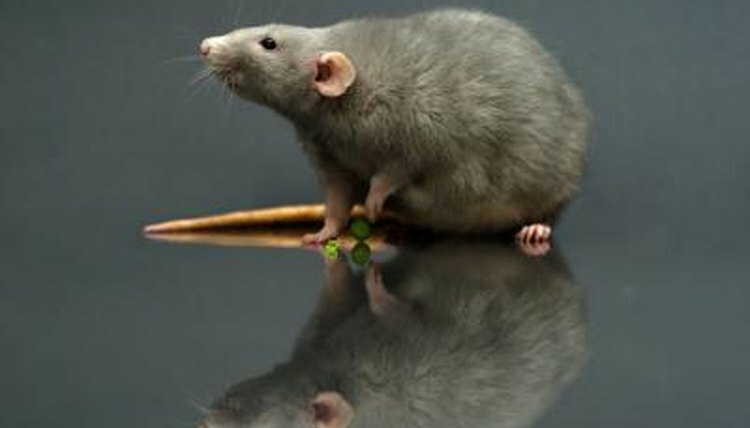 Domestic rats are highly intelligent and friendly creatures, so they're relatively easy to train. With regular handling and interaction, you can train a pet rat to perform a number of commands, including sitting on your shoulder. Use caution during the training process and thereafter to ensure your rat doesn't fall from your shoulder and get injured. Take your rat out of his cage and play with him on a regular basis. Feed your rat from your hand to establish trust and facilitate bonding. If your rat acts skittish or jumpy, hold off on shoulder training until he's more comfortable with being physically handled. Rats enjoy interaction with their human companions, once you have their trust, and will feel more comfortable being handled at greater heights in time. Place your rat on your shoulder when you're sitting someplace low and soft, like on a couch. This way, if your rat falls or tries to run down your arm or back, he'll have a soft landing. As soon as your rat stays still for a moment, give him a treat and use a clicker simultaneously. This will start getting your rat associated with being on your shoulder as a good thing that earns him tasty rewards. Practice placing your rat on your shoulder regularly to make it an ingrained habit. Continue to use your click-and-reward training repeatedly. You'll eventually reach a point where your rat will anxiously scurry up to your shoulder on his own as soon as you take him out of his cage. You can slowly back away from the click-and-treat training, as long as you do occasionally reinforce the behavior and reward your rat for perching on your shoulder. If your rat is wary of heights or feels unstable, he may claw at your shoulder and neck to get a grip because he fears falling. Keep your hands free when practicing this technique with your rat so you can hold him for support or catch him if he starts to fall. Be especially careful moving about when your rat is on your shoulder, as it may take a little time and patience for him to become accustomed to this new handling routine.